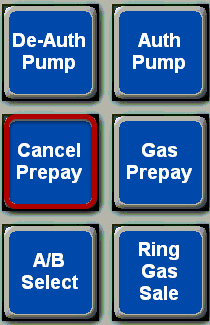 TravStar1 Point Of Sale SystemRegister Manual Gas TransactionsHow Do I Cancel a Prepay from a Dispenser? How Do I Cancel a Prepay from a Dispenser? This lesson will teach you how to cancel a prepay transaction. The prepaid dispenser will have an A on the pump icon indicating that it is currently Authorized. Touch the pump icon to select the dispenser. Touch the "Cancel Prepay" button. At this point, you will need to return money to the customer. (1) Type the dollar amount owed to the customer using the number pad on the keyboard. Prev: How Do I Change Fuel Prices From the Register? Next: How Can I Tell If a Dispenser Is Fueling or When It Is Complete?